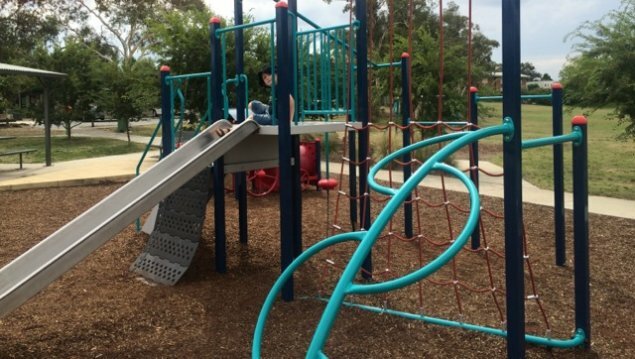 Whether you’d like to run, climb and explore or sit back and share a meal, Chifley Play Space is a great place for the whole family. My experienced play experts Artie (four years) and Clyde (two years) gave the equipment at Chifley a go this week and let me know their verdict! 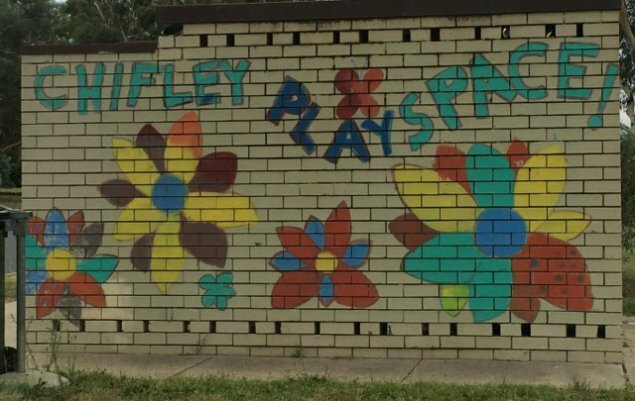 Chifley Play Space has three key play areas; two with climbing equipment and a third with a swing set. When approaching from the Chifley shops car park, the first area that you reach has towering walls of climbing ropes, rock climbing and ladders (see above). 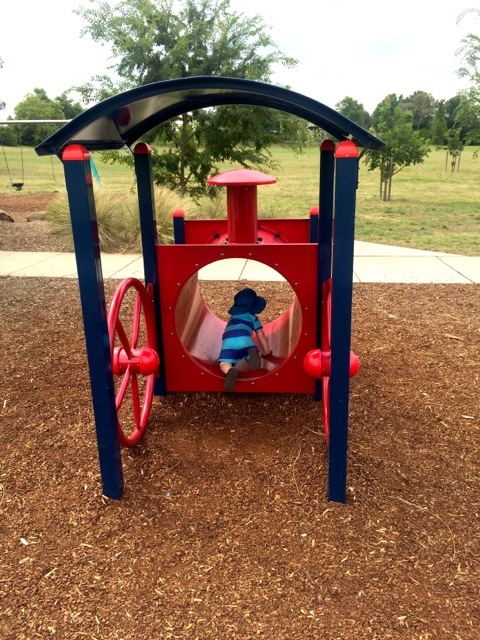 The walls are divided into sections and while both Artie and Clyde found sections at their level, it is probably better suited to older children. The next area, which is geared towards younger children, includes steps with a handrail, large platforms and a slide. Artie used his “huge muscles” to navigate across the climbing challenge. One great feature of this area is the train tunnel which encourages use of cross motor skills as well as many hilarious games of peek-a-boo! Down by the swings, Clyde enjoyed playing around the decorated totem poles on which he could identify various animals and colours. The swing set includes a regular swing as well as one with a belt so that both boys were safe while having fun. For those looking to have a BBQ and run around with the football, you are well catered for here as well. Chifley oval (including a basketball court) backs up to the playground and provides a safe green space for the little legs to run. The BBQ areas are complete with tables and chairs, bins and great shade. If you forget your snacks, do not despair as the Chifley shops are just metres away. There are conveniently located bins and toilets at the park. As the park is located across from the shops, little ones need to be watched at all times as the car park can get busy. After a quick ice cream break, both of the boys were eager to get back to the equipment for another turn on everything. It was a great afternoon out for us and we will definitely be back! Where: Chifley place, across from the shops. Access via Eggleston Crescent, Chifley. 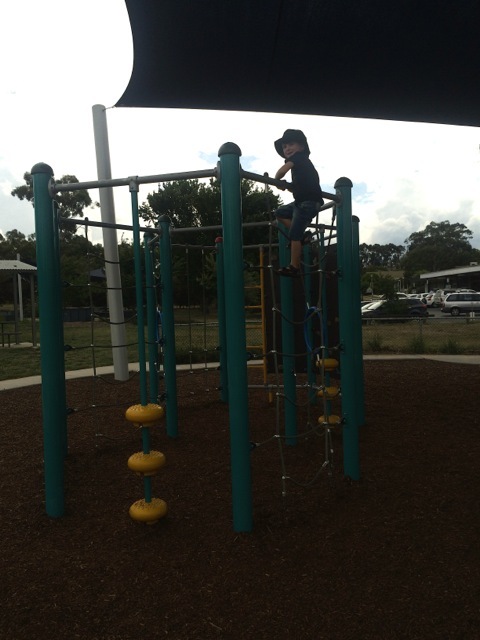 I concur – a great piece of playground infrastructure there at Chifley. There really is something for kids of all ages here, with plenty of room to boot. As for the shops, the podiatrist is the best in town ( I’m there frequently), A Bite to Eat is a tad overrated in my book. The best part is the lipsmackingly good coffee & pastries from The Friendly Grocer across the road. Pull out a blanket, plenty of shade about – great way to spend a couple of hours with the young uns. had astromonkey and astrochicken there this morning – they loved it, too. a well set out playground, next to good coffee. excellent planning.